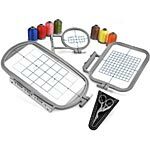 The 6-3/4-inch-by-4-inch large embroidery hoop for the Brother SE400 is designed to allow you to stitch designs larger than the standard 4×4 inch hoop or to combine several small designs without having to rehoop your fabric. For example, if you’ve ever wanted to add lettering or a small design to a 4×4 inch design, this large hoop makes it easier and faster. The adjustment screw makes it easy to hoop a wide variety of fabric thicknesses. The hoop comes with a clear, plastic grid. 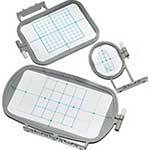 The notches and marks on the grid help you line up and accurately place the designs. 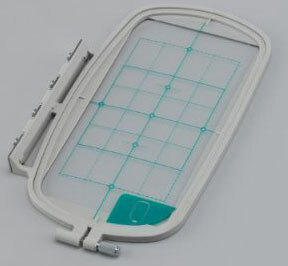 NOTE: This hoop does not allow you to stitch designs larger than 4×4 inches at one time, because the maximum embroidery frame area is a physical limitation of the Brother 400 embroidery unit and can’t be increased by the hoop. To stitch larger designs, you either have to split it with software, or combine smaller designs manually. It it a multi-position hoop that allows you to stitch them without rehooping. See the four pins on the left side of the hoop? If you attach the hoop to the embroidery unit using the top two pins, the machine will stitch in the top part of the hoop. Moving the hoop to the middle two pins, will stitch in the middle. And the bottom two pins, stitch in the bottom part. The sections overlap, so you have to figure out how to place your designs within the overall area. For example, if you want to stitch a name under a 4×4 inch design. Attach the hoop using the top two pins. Select and stitch the 4×4 design. Then move the hoop to the lower two pins. Select the name and stitch it. This is much easier and more accurate than having to rehoop and re-position your fabric after stitching each design. I was able to embroider a 5-foot sign for an upcoming craft faire in just a couple of hours! It would have taken way much longer if I had used the medium hoop that came with the machine. The Brother SA434 Large Hoop is for use with these Brother embroidery machines: Brother SE-400, SE-350, SE270D, HE-240, HE-120, LB-6800, LB6770, Innov-ís 500D, Innov-ís 900D, Innov-ís 950D, PE-270D, PE-300S, and PE-400D. The insert said not to use the hoop if your carriage cover did not have the word Brother on it. Mine does not, so I was afraid to use it. I read through the comments on this item twice, and the second time, read one about this very issue that I had overlooked the first time. I am trying to use Sew What Pro with the 6-3/4-inch-by-4-inch large embroidery hoop, but what I see when the software splits it in three sections, it overlaps; one below section two; and two below section three. Can you explain how I can use the hoop with the above mentioned software in sections with out this overlapping? It would be very helpful for all us that have a 4 X 4 hoop to see more help using it with this larger hoop. 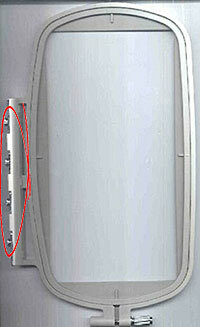 I can’t afford to upgrade to a machine that uses the popular 5 X 7 hoop and believe there are others that feel the same. I know there is a lady that does a lot of videos but after watching a few I could no longer watch her. Side note for those who may purchase an embroidery machine soon. When I purchased my machine I was told it only came with a 4 X 4 hoop, but she did not tell me that I could not purchase a larger hoop later. Being a novice at that time I did not know to ask. Was there a specific response to Bonny’s question? I have the exact same question now that I just purchased a new Brother SE400. I downloaded SewArt to digitize a logo successfully and am now considering the Sew What Pro to combine 4×4 designs into a larger one. Thank you. I aptceriape you taking to time to contribute That’s very helpful. I bought the large hoop so I could do larger logos on T-shirts. Using the alphabets in the SE-400 I only get as far as 4-5 letters before I get the message ‘too large for hoop’. The logo I made had such small letters below a larger script it would bind the stitching. I’d like the logo itself to be about 5″ long with the larger letters and the lettering underneath to be about 3-1/2″ long. My guess is I’ll have to design it in My Editor like I have been but would like to use the fonts in the SE-400 for a change. Any ideas? How do you determine which pins to use first in the large hoop? I have a SE-400 and I just bought a larger hoop. If you are monogramming a name, which ones do you do first? The right pins or what? I also have trouble lining up my letters after I have rotated them. Some are higher than others. I need help! !